We are proud to offer a great selection of Ford truck and SUV repair manuals by Chilton and Haynes, for do-it-yourselfers, at discount prices. These Ford auto manuals are the best available and intended for truck owners who like to do their own vehicle service and repairs. They feature sequential instructions, accompanied by clear photos, that show you the steps you'll have to follow to properly service components. You can repair your Ford truck! The Ford pickup truck repair manuals we sell are written for people who want to work on their own trucks and SUVs. The factory owner's manual (the booklet that came with the vehicle), is not enough, and factory-issued Ford shop manuals can be expensive overkill as those books are intended for factory-trained mechanics. Chilton and Haynes manuals, on the other hand, are specifically written for the do-it-yourself "weekend" mechanic. These manuals show you, with photos and words, the steps necessary to service any system, whether it's the brakes, exhaust, air conditioning/heater, electrical (with wiring diagrams), drivetrain, suspension, etc., all the way to a complete engine or transmission disassembly and rebuild. When it comes to Ford trucks, repairs and regular service are made much easier with these comprehensive guides. The Motor Bookstore offers a great selection of Ford and Lincoln truck and SUV repair manuals at discount prices, ranging from the Ford Courier, Ranger, Bronco II and full-size Bronco to the new Ranger, Explorer, Mountaineer, Navigator and Super Duty. You'll be able to find a Ford F-150 repair manual, F-250 manual and much more. 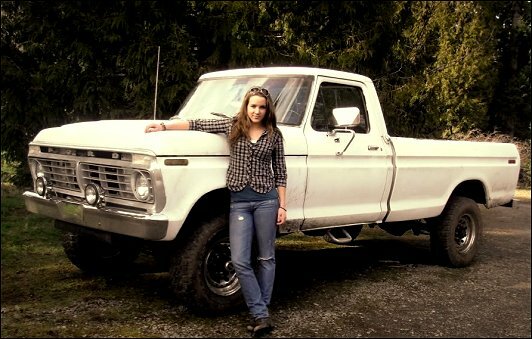 Above: Sasha La Greide poses with her 1975 Ford F250 Highboy, powered by a 390 c.i. engine coupled to a 4-speed transmission.